Published on March 18, 2019 in Digging for Dirt and National. Closed Tags: construction, construction industry, contractors, environment, Fish and Wildlife Service (FWS), Gray Wolf, infrastructure, NOAA’s Ocean Exploration Advisory Board, Tom Ewing, Tom Ewing's Environmental Update. * NOAA’s Ocean Exploration Advisory Board meets for two days next week in Oakland, CA. A primary topic on the draft agenda is NOAA’s “Blue Economy,” which includes marine transportation, tourism, ocean exploration, and fisheries and amounts to approximately $320 billion of the United States’ gross domestic product (GDP). The OEAB advises NOAA leadership on strategic planning, exploration priorities, competitive ocean exploration grant programs and other matters as requested by NOAA’s Administrator. The 12-member Board is chaired by John R. Kreider, Senior VP Advanced Technology of Oceaneering International, Inc.
* The Fish and Wildlife Service (FWS) proposed last week, on Friday, in a 40-page Federal Register notice, to delist the Gray Wolf – – from the List of Endangered and Threatened Wildlife. By the next day, Saturday, the docket had over 500 comments from interested groups and citizens. 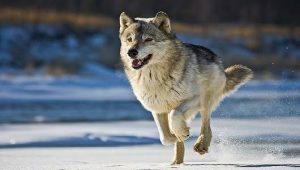 This change – which started, nationally, in 2013 – would not impact the status of the Mexican wolf (Canis lupus baileyi). FWS writes that “We propose this action because the best available scientific and commercial information indicates that the currently listed entities do not meet the definitions of a threatened species or endangered species under the Act due to recovery.” The comment period closes on May 14. * Two big deepwater port projects are starting off Texas’ coast. One is called COLT, the other SPOT – not sure if those are acronyms or not. SPOT will have over 100 miles of 36” double on-shore and in-water pipelines. The new port will allow for up to two very large crude carriers (VLCCs) or other crude oil carriers to moor at single point mooring (SPM) buoys and connect with the deepwater port via floating connecting crude oil hoses and a floating vapor recovery hose. The maximum frequency of loading VLCCs or other crude oil carriers would be 2 million barrels per day, 365 days per year. COLT has similar statistics. MARAD and the Coast Guard are starting an environmental impact statement for SPOT and they have scheduled an open house and public meeting in Lake Jackson, TX next week. You’ll be happy to know there’s free parking.